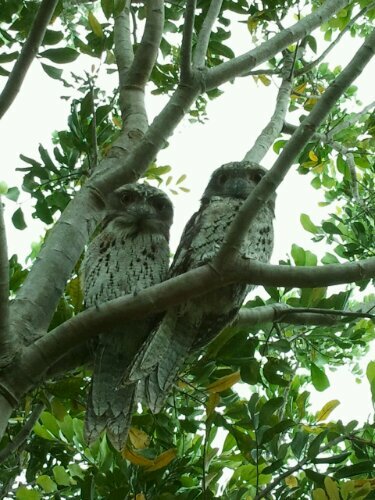 Tawny Frog Mouth owls in the tree in front of my aunt’s house at Stuarts Point, NSW, Australia. They stay for a few months during Summer, and have increased over the last few years from 2 to 4, in number. This entry was posted in Blog and tagged Australia, my life, nature. Thank you. There’s something about an owl… the have an aura or elusiveness & mystery, that makes them extra appealing. Aren’t owls something? Some years ago, a screech owl took up residence in the woods behind my parents’ home. Late at night I could hear it call as it hunted and, occasionally, I’d find the remains of some animal or bird it had eaten. Just like us at the family dinner table, it had a favorite perch on which to dine. I never did see it, though. Great that you’ve not only seen these guys but know that they’ve doubled in numbers. How cool is that? It is something special to hear or see an owl or even know they live nearby 🙂 We love our wildlife, whether city or country and get a kick from knowing we share the environment. WOW. Owls are so cool – and you have multiples – so unfair. Well, ok, it looks like a nice spot for them. You are so lucky to be able to photograph such beautiful birds. It’s not very often I see them here, though they’re definitely around as I can hear them. HOw lucky you are EllaDee, and to get two of them, doubly jealous.